New May 2009 CTP for Microsoft “Oslo” is out. If you don’t know what “Oslo” is, it’s set of future Microsoft modeling technologies. You can find out more at “Oslo” Developer Center. In this release Microsoft finally is going to include “Quadrant”, a GUI tool for “Oslo”. As for previous CTPs you need .NET Framework 3.5 SP1, SQL Server 2008, and VS 2008 or higher. New install for “Oslo” allows to to customize the installation. If you select “Install Now” instead of “Customize” option, all of “Oslo” is going to be installed. It includes: “Quadrant, “Oslo” repository, and “Oslo” SDK. You must to have administrator privileges in order to run installation. You can find more details by reading Release Notes. In case you have a previous CTP installed on your machine, you must uninstall it before installing new CTP. Also you must drops the ‘Repository’ from your SQL 2008 database. Microsoft also provides us with May CTP Samples. 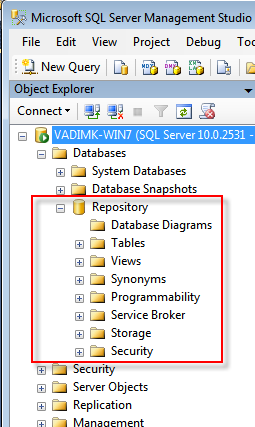 “Oslo” installation also is going to create Repository in your SQL 2008.